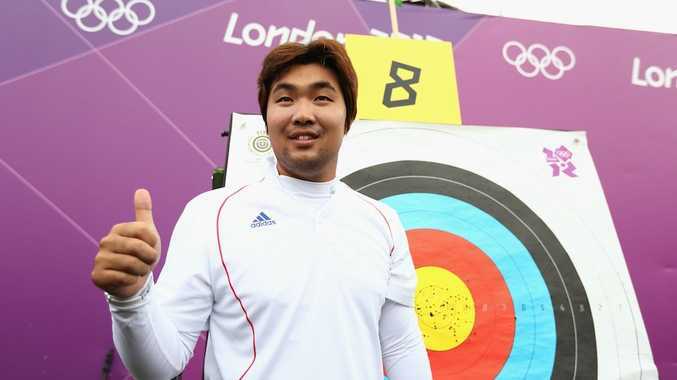 A LEGALLY blind South Korean archer is one of the first athletes to claim a world record at the London Olympics. Im Dong-hyun broke his own 72-arrow mark of 696 by three points and also helped his nation to another record in the team shoot. Im, Kim Bumbin and Oh Jin-hyek crushed the standing 216-arrow world record of 2,087 by 18 points. The Korean trio took advantage of the perfect conditions claiming the top three seedings with Im leading the way on 699 points. It is the third time Im has broken the world record since the London Olympic test event.